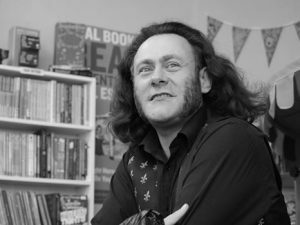 Today I’m delighted to welcome author Jon Hartless, hot on the heels of the publication of his latest book, Full Throttle. For those who don’t know, Steampunk is usually set in an alternative nineteenth century timeline in which technology had advanced to a greater degree than in reality, but the idea is flexible so please don’t feel that this definition is the only one. The Bentley Boys were very famous racing car drivers of the 1920s, beloved by the media for their wealth, social status, and derring-do racing lifestyle. This was at a time when most people still couldn’t even afford a car, never mind race one, and as such I thought the world of motor racing would be a perfect symbol for the gulf between the rich and the poor. As ideas go, this one had quite a lot encoded within it. To begin with, this was to be a dirty, grubby Steampunk world, not a bright, shining version. Despite the presence of cutting-edge technology, my story would only feature glimpses of it, for only the wealthy elite would be able to afford it. This was to be a world very like ours, in which opportunity only exists for the rich and well-connected while everyone else is presented with the illusion of opportunity, a practice very familiar to us today. And within this world we would focus on a young girl condemned to a life of poverty – material and intellectual – because of her working class background, her gender, and also her disability – she only has one arm, owing to a birth defect, and a weak knee from the same cause. But fortunately for her, her father has a small workshop and a secret project; a petrol engine designed specifically for motor racing. And there it was; an intelligent heroine named Poppy Orpington and a petrol-fuelled monster of a car called Thunderbus would rise up to challenge the racing elite and the social order, to smash conventions apart. Every piece slotted neatly into place. And having thought of this, and having practically the whole thing in my mind, I then abandoned it to rewrite the core concept. For no reason at all. Other than I was a complete prawn. For some reason I just lost faith in it and thought I’ll never get it accepted. Instead, I reimagined it as a book for young children, with large pictures on every page, where Poppy is a girl of about 8, whose eccentric father makes a car and they go off racing, towing a caravan behind them. I then binned that idea and thought of making it a bit more “pulp”; in this version, Poppy – now a grown woman without any birth defect – is heading home from work one evening and is accosted by a sinister man who offers her 50 quid for something called Thunderbus. She has no idea what he’s talking about, and walks on. Then another man pops up and offers her 100 quid. Then two more agents appear and offer 250, and when again she refuses they attack her and try to take her prisoner. Poppy promptly goes Mrs Peel on their arses (old TV reference) and escapes. Back home she finds a letter from a solicitor saying very sorry, your father has died, and you have inherited everything; a small workshop, several debts, and something called Thunderbus. And at that point I gave up on that version, though it did briefly rise vampire-like with a new take, in that I thought; what if Poppy’s father knows it will take him about 15 years to make Thunderbus because of the complexity of doing it all alone, plus he knows that super-strength will be required to pilot the tank, and he looks at his baby daughter, asleep in her crib, and lops her arm off, thereafter telling her it is a birth defect and bringing her up to obey him in everything? The action would then jump forward to Poppy as a teen girl, worshiping her father as she has been brainwashed by him, and using her mechanical arm to use Thunderbus as her father commands, blowing up a bank here or a military installation there. The story would have then been of her ‘awakening’ as she realises the Mephistophelian nature of her father and rebels against him. But that idea died a death also. Thankfully. And so, after all that, I finally thought, “hang on, what was wrong with the racing idea that practically wrote itself?” I went back to that, and the rest was plain sailing. Except for about thirty thousand rewrites and almost one hundred rejections. But these are a writer’s usual problems, or at least they are my usually problems, and finally the book was accepted and published, and here it is. If there is any point to this blog, I suppose it is have faith in a good idea. Or don’t be afraid to change it, if need be. Or something. Jon Hartless was born in the seventies, which is rather long time ago. 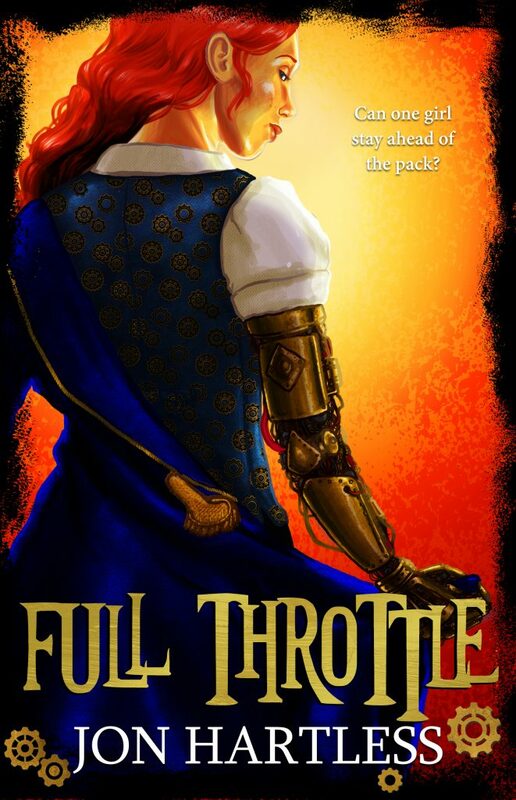 Full Throttle is his first novel with a traditional publisher. Many thanks Jon, sounds great. Fascinating read. I wish you much success. Jon, sounds like a wonderful read. Will have to check it out. I do enjoy your writing.